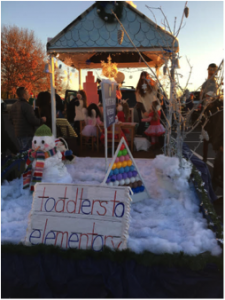 North End Montessori School joined hundreds of floats for the wonderful display of Yuletide fun that lines the streets of downtown Manchester, NH during the Holiday Season. We enjoyed seeing the faces of so many children and families waving and cheering as we tossed candy and displayed our school spirit. A special THANKS to the volunteers whose imagination and hard work made our float the 1st place winner in the Youth Division in 2015! If you would like to volunteer to help with the float, walk/ride alongside us or want information about this year’s parade, feel free to contact us.